Groups of 20 or more are eiligible for some great benefits at Arvest Ballpark. 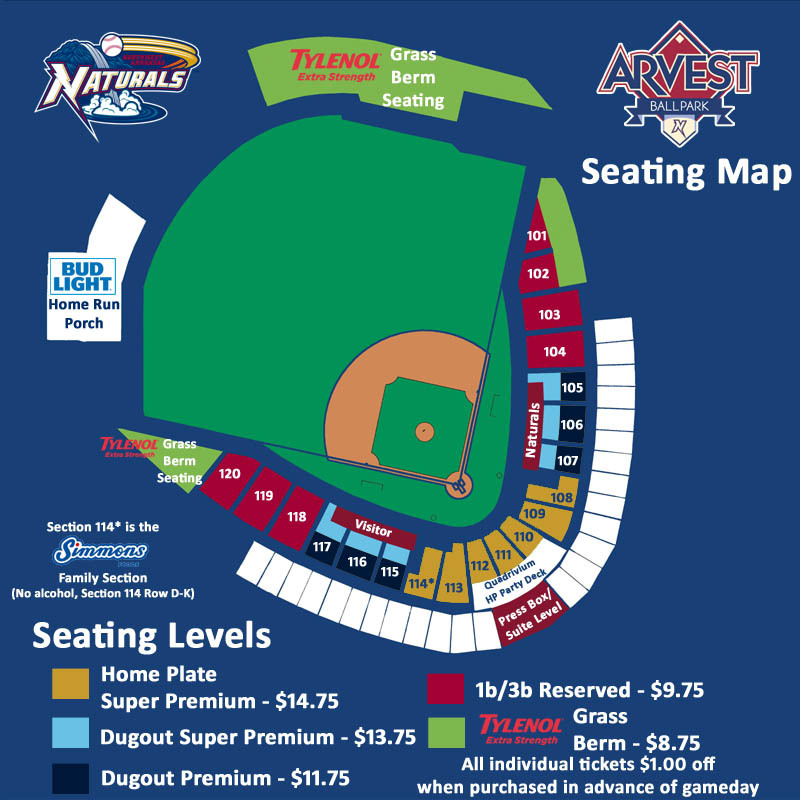 The Naturals offer discounted group tickets that are perfect for family outings or corporate events. Book your next group outing with the Northwest Arkansas Naturals today! Looking to save some extra money? The Northwest Arkansas Naturals offer $5 group nights every Tuesday and Wednesday night (excluding July 2 & July 3). Groups of 20 or more, if purchased in advance, will enjoy $5 1B/3B Reserved Tickets. The Bud Light Home Run Porch is located behind the left field fence at Arvest Ballpark, and features flexible picnic-style seating for groups of 50 - 1,500. This area includes an all-you-can-eat buffet, drinks & tickets to the game. Kids 12 & under discounts are available. Some of the best views in the house, the Quadrivium Home Plate Party Deck is an exclusive picnic table area located behind home plate for 30-100 people and is available to only one (1) group per game. Suites at Arvest Ballpark are available on a nightly basis and you'll enjoy a spectacular view of the game, cable television, air conditioning, a private restroom, indoor seating & outdoor seats plus an exclusive suite menu. Reservations are available on a first-come, first-served basis. The Sam's Furniture Champions Suite and Indigo Sky Casino Crown Club can accommodate 30-50 people and feature all of the amenities of our other suites including air conditioning, private restrooms, televisions, indoor & outdoor seating. Book your Naturals group event today by calling (479) 927-4900 or emailing groups@nwanaturals.com.